Fear – Doubt – Guilt – Uncertainty are all a mixed bag that sabotage everyday parenting interactions. Fear for imminent danger, like tigers in your bedroom, is “real”. In those cases, stewing about the fear is not a good idea. It’s flight or fight time – do something or hide in the closet immediately. Fear creates a fight or flight reaction that ignites the reptilian brain, silences the over-talking and over-thinking brain, and heightens adrenaline – all very important when you need to stop a tiger or get out of a burning building quickly but not typically effective when responding to an out-of-control or needy child. Fear turns into panic and frenzy when we rush to react rather than calmly respond to day-to-day parenting challenges. 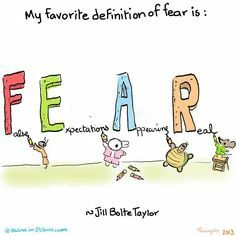 Reacting is gasoline on the fear fire! Walter Mischel in his new book, The Marshmallow Test, reminds us that the secret to self-control, to life success, to emotional mastery is to cool the hot buttons. Will this hurt my child? Am I doing the right thing in the face of something I don’t understand as a parent? Here are 4 easy recommendations for staying connecting through the fears, worries, struggles, uncertainties. 1. Believe in yourself! Parents with an internal locus of control raise children who are more resilient and confident regardless of life’s adversities. Yes, you are ENOUGH!!! 2. Accept your child’s behavior as exactly where they need to be right now. Your child is exactly where he is, in this stage, with this combination of temperament, personality and skills. That’s reality. Being frustrated or wanting him to different or the situation to be easier isn’t going to help you or your child. 3. Search for understanding, but not to the point of confusion, overwhelmed or inaction. Your best “understanding” will only arrive AFTER the stressful times are over, after you found your way through. Consider ages and stages of development. Most things that drive parents crazy or that through them off course are predictable and necessary parts of the growing pain. Here are FREE downloads for parents and children “growing together” from infants through 5 year olds. But remember, you have to live it before you learn it! 4. Stay connected. Feeling fear, at least the “False Expectations Appearing as Reality” kind, is not the time to fight or flee – not the time to disconnect from children. Your child needs your help to grow and learn. As smart as they are, they really can’t raise themselves. They really can’t be in charge of families. Age-appropriate power is essential for kids, and lots of it. But the fear moments that make parents swim in uncertainty are the ones that have kids drowning. The Entitlement-Free Child describes creating a bridge from where children are to where you want to take them based on your beliefs, your insights and your knowledge. That’s enough! It may be trial-n-error. There may be a few false starts and a few crashing bridges but those are valuable too. Those are your family stories. That’s what adds to your wisdom pile. Trust me – after you get over the bridge, it will all be clear as can be! It really is a safe and beautiful world!